Cardiac, skeletal and smooth muscles are the three types of muscles found in the human body. The main function of muscles in the body is to help to move and maintain posture. Muscular movements help the passage of materials such as blood, lymph, and food in the digestive system. The main difference between cardiac skeletal and smooth muscle is that cardiac muscles perform involuntary muscular movements of the heart, aiding the heart to pump blood throughout the body, while skeletal muscles perform a voluntary muscular movements of bones, aiding physical movements of the body such as walking, running, and writing and smooth muscles perform an involuntary muscular movements of internal organs, aiding functions of the body such as digestion, urination, and breathing. Key Terms: Autorhythmicity, Cardiac Muscles, Endomysium, Epimysium, Intercalated Disks, Pacemaker Cells, Skeletal Muscles, Smooth Muscles, Syncytium, Varicosities. Cardiac muscles are a type of muscular tissues found only in the heart. The cardiac muscles are involved in pumping blood throughout the body of animals via highly coordinated, rhythmic muscular contractions. The cardiac muscle cells are Y-shaped cells, and they are shorter and wider than skeletal muscles. Each cardiac muscle cell is mononucleated. Since it is a high energy requiring muscle, the cardiac muscle cells comprise many mitochondria and myoglobin. The arrangement of actin and myosin striates the cardiac muscle cells. Thickly arranged myosin filaments form dark bands on the cardiac muscle cell, making it striated. The light color bands occur due to the loosely arranged actin filaments. The structure of the cardiac muscle is shown in figure 1. Each cardiac muscle cell is in contact with another three or four cardiac muscle cells. The overlapping region in each cell forms finger-like extensions in the cell membrane. These structures are called as intercalated disks. The structure of the intercalated disk forms gap junctions and desmosomes between the two cells, allowing the passage of electrochemical signals between the two cells. On that account, cardiac muscle is capable of contracting very quickly in a wave-like pattern. The pacemaker cells found within the cardiac muscle allow the cardiac muscle to contract in its own rhythm in a process known as autorhythmicity. Thus, the pacemaker cells serve as a functional unit in stimulating cardiac muscle and, the pacemaker cells are referred to as syncytium. The pacemaker cells also receive neuron signals from the autonomic nervous system to increase or decrease the heart rate. The action potential of the cardiac muscle cells is relatively long. The cardiac muscles are composed of a sustained depolarization known as a ‘plateau’. The plateau is governed by the entry of calcium ions into the cardiac muscle cells by channel proteins. The sustained depolarization provides a longer contraction to the cardiac muscle. The skeletal muscles are the striated muscles, which are typically attached to the skeleton and under the voluntary control. The size, shape, and the arrangement of fibers vary depending on the position of the body. The skeletal muscles are composed of thousands of cylindrical cells, which are individually wrapped with connective tissue sheaths called endomysium. These wrapped muscle cells are bundled together and again wrapped with a connective tissue sheath. This connective tissue sheath is called the epimysium. Several compartments of muscular cell bundles are involved in forming a muscle. Each muscle cell bundle is called fasciculus. Each fasciculus is wrapped with a connective tissue sheath called perimysium. The connective tissue layers provide support and protection to the muscle cells. The structure of a skeletal muscle is shown in figure 2. The skeletal muscles are attached to bones by tendons. The primary function of the skeletal muscle is to contract, and the contraction of skeletal muscles is governed by the peripheral nervous system. The skeletal muscles aid in movement and locomotion. The blood vessels found inside the skeletal muscles provide nutrients and oxygen to the muscles. Smooth muscles are a type of muscle fibers which are not highly ordered; these are found in the gut and other internal organs. Smooth muscle is present in the organs such as urinary bladder, stomach, intestine, uterus, and the walls of blood capillaries. The smooth muscles are involuntary muscles, which are not striated. The shape of the muscle cell is spindle-like with a single, centrally located nucleus. The smooth muscle cells are not striated. The pacesetter cells in the smooth muscles trigger the action potential of the autonomic nervous system and contract the smooth muscle cells. The motor units of a smooth muscle are shown in figure 3. Typically, the contraction of the smooth muscles occurs as a single-unit. However, multiunit smooth muscles are found in iris of the eye, trachea, and large arteries. The nerve fibers of the autonomic nervous system form neurotransmitter-filled bulges known as varicosities. The single-unit smooth muscle cells are joined to each other by gap junctions and contract as a single unit. All the visceral organs of the body except the heart contains single-unit smooth muscle cells. The visceral smooth muscles show the stress-releasing response in which the mechanical stress of the hollow organ is immediately followed by the contraction. The multi-unit smooth muscles are not electrically coupled since they are not connected by gap junctions. The main function of smooth muscles is to promote the passage of fluids through the circulatory system and food through the digestive system. The contraction of a single-unit smooth muscle is shown in figure 4. Cardiac, skeletal, and smooth muscles collectively form the muscular tissue of the animal body. Each and every muscle type is involved in the internal and external movements of the body. The regulation of each type of muscles is done by the nervous system of the body. Cardiac Muscles: Cardiac muscles are a type of muscles found in heart, and are responsible for pumping blood throughout the body. Skeletal Muscles: Skeletal muscles are the striated muscles, which are typically attached to the skeleton and are under the voluntary control. Smooth Muscles: Smooth muscles are a type of muscle fibers, which are not highly ordered and found in the gut and other internal organs. Cardiac Muscles: Cardiac muscles perform involuntary muscular movements. Skeletal Muscles: Skeletal muscles perform voluntary muscular movements. Smooth Muscles: Smooth muscles perform involuntary muscular movements. Cardiac Muscles: Cardiac muscles are found only in the heart. 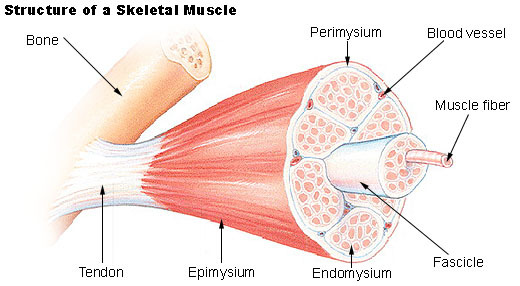 Skeletal Muscles: Skeletal muscles are found attached to bones and skin. Smooth Muscles: Smooth muscle cells line walls of the internal organs. Cardiac Muscles: Cardiac muscles are responsible for pumping blood throughout the body. Skeletal Muscles: Skeletal muscles power the joints, aiding physical movements of the body such as walking, running, and writing. Smooth Muscles: Smooth muscles move internal organs of the body such as bowels and vessels to facilitate body functions such as digestion, urination, and breathing. Cardiac Muscles: Cardiac muscles comprise branching chains of cells, which are connected by porous intercalated discs with a single nucleus. Skeletal Muscles: Skeletal muscles comprise very long, cylindrical, multinucleated cells. Smooth Muscles: Smooth muscles comprise single, tapering, single nucleated cells. Cardiac Muscles: Cardiac muscle cells are striated with many myofibrils in orderly arrangements. Skeletal Muscles: Skeletal muscle cells are striated with orderly arranged myofibrils. Smooth Muscles: Smooth muscle cells are not striated. But, fewer myofibrils are found in varying length. Cardiac Muscles: Cardiac muscles are self-stimulating. Impulses spread from one cell to another. Skeletal Muscles: Skeletal muscles are not self-stimulating. The innervation of each muscle fiber occurs by somatic motor neurons. Smooth Muscles: Smooth muscle cells are self-stimulating. Impulses spread from one cell to another. Cardiac Muscles: Cardiac muscles are under regulation of the nervous system, endocrine system, and various chemicals. Skeletal Muscles: The skeletal muscles are under regulation of the nervous system. Smooth Muscles: Smooth muscles are under regulation of the nervous system, endocrine system, various chemicals, and stretching. Cardiac Muscles: Cardiac muscles have an intermediate energy requirement. Skeletal Muscles: Skeletal muscles have a high energy requirement. The skeletal muscle cells have lots of mitochondria, myoglobin, and creatine. Smooth Muscles: Smooth muscles have a low energy requirement. Cardiac Muscles: Cardiac muscles have an intermediate speed of contraction. But, these contractions quickly spread throughout the muscle via intercalated disks. Skeletal Muscles: Skeletal muscles exhibit fast contractions. Smooth Muscles: Smooth muscles exhibit slower contractions. Cardiac Muscles: Cardiac muscles exhibit rhythmic contractions. Skeletal Muscles: Skeletal muscles do not exhibit rhythmic contractions. Smooth Muscles: Smooth muscles exhibit rhythmic contractions. Cardiac Muscles: The strength of the cardiac muscles increases with the stretching. Skeletal Muscles: The strength of the skeletal muscles increases with the stretching. Smooth Muscles: Smooth muscles exhibit a stress-releasing response. Cardiac Muscles: Cardiac muscles do not fatigue. Skeletal Muscles: Skeletal muscles easily fatigue. Smooth Muscles: Smooth muscles do not fatigue. Cardiac, skeletal, and smooth muscles are the three types of muscles found in the body of animals. Cardiac muscles are only found in the heart, and they are involved in pumping blood throughout the body. Skeletal muscles can be found attached to the skeleton of the body, involving in the movement of the body as well as the locomotion of the animal. Smooth muscles are found in the walls of the hollow organs, and they are involved in the internal movements of the body, allowing the passage of fluids and food. Thus, the main difference between cardiac skeletal and smooth muscles is their role in the movement of the animal body. 1.”10.7 Cardiac Muscle Tissue.” Anatomy and Physiology. OpenStax, 06 Mar. 2013. Web. Available here. 07 July 2017. 2.”Cardiac Muscle Tissue.” InnerBody. N.p., n.d. Web.Available here. 07 July 2017. 3.”STRUCTURE OF SKELETAL MUSCLE.” SEER Training. N.p., n.d. Web. Available here. 07 July 2017. 4.”Muscular Tissue.” Structure and Functions of Human Tissue Types.N.p., n.d. Web. Available here. 08 July 2017. 5.”The Smooth Musculature.” Kenhub. N.p., n.d. Web. Available here. 08 July 2017.